Bad Santa was discovered by Axe Cop and his friends when he had stolen Leaf Man’s powers. Bad Santa has all the power of Christmas and he plays a guitar that hurts people’s ears. He steals presents and the real Santa really hates him. He was defeated when his blood got on Sockarang, giving Sockarang Bad Santa powers as well. Sockarang took his guitar and overpowered him. powers: the power of Christmas, electric guitar. I’m taking a break from my Making Axe Cop blogs this week. Instead, as a continuation in the history of Axe Cop, I am going to share with you the raw notes I took on my phone called with Malachai to write Axe Cop #5. Axe Cop #0-4 were written in person, so I didn’t have notes for those. This was the first time I tried writing with Malachai over the phone. I was amazed how well this went. I was afraif it wouldn’t have the same feel. In some ways it was different. It was a lot more information, less action. But it was actually a great way to work. I found this old text file in my Axe Cop folder. I have a folder on my computer I started called “Malachai” when he was three. It includes a few drawings I let him do on my Wacom tablet, and a few drawings he dictated to me as I drew, then one day I added a folder called “Axe Cop”, because I drew a few Axe Cop comics with him. 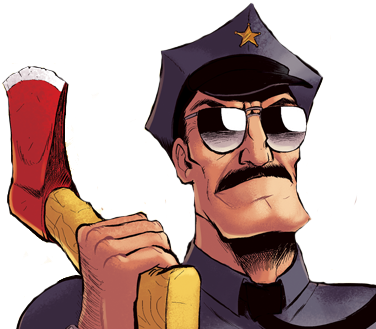 To this day, my “Axe Cop” folder is still inside the “Malachai” folder, and it is freaking massive. As you read, if you know the comic well, you will see how I organized this and did some editing. we need to save leaf man. Q: what does Ralph do? Q: Does anyone die in the fight? They go back to a try out: baby man. Q: Where are the bad guys? do they get leaf man’s powers back? how do they get the blood out of bad santa? I’m tired and hungry, so I am going to eat stuffed eggs with mayonnaise and yolk and mustard and then you put it in where the yolk was and paprika on top. and also “evil flying book” which flies around and bites people. in order to fight these guys they must have another tryout. At the tryout, Sockarang joins the team. His arms are socks and they shoot off and return like boomerangs. So Sockarang, Leaf Man, Axe Cop, Ralph, and Avocado soldier go to fight bad santa. At the fight, ralph just sings “tick tock the mouse ran up the clock”. Bad Santa hurts their ears with his guitar. Evil flying book keeps biting them. They retreat to hold more tryouts. At the tryouts they recruit Baby Man, Wrestler, and Uni-man. Uni-man says he took up crime fighting when his child was stolen. Baby man’s motto is “shake what your baby gave ya.” and he can fly when he gasses. In the fight they realize that the book is actually a robot. The wrestler throws uni-man into the book and it explodes. they defeat bad santa by taking his guitar… sockarang gets bad santa blood on him and gains his powers. They win, but leaf man never got his powers back, so avocado soldier gives them back using his unicorn horn. Leaf Man’s powers were stolen by bad Santa! We need to have more try outs!